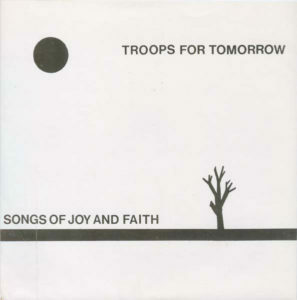 This entry was posted on February 3, 2011 at 7:55 pm and is filed under 1980s, 1982, furyo, gene loves jezebel, portion control, post-punk, troops for tomorrow, uk . You can follow any responses to this entry through the RSS 2.0 feed You can leave a response, or trackback from your own site. I'm not sure of the New Order reference, but I can definitely hear a strong Modern English sound in these tracks. Thanks and keep up the good work! Ha! I literally just found this 7" today at Bleecker Bob's! BTW, the reason it sounds so much like Modern English is because Robbie Grey produced it! a little late to this post… did the band have some connection to the neofolk/martial scene, or are the awesomely fascistic band name and album title purely coincidental? really good stuff. ballsy vocals. Still not loading for me. Urgh! Gary Mcdowell (of Modern English) later joined my band, DeLuca, playing bass alongside Nigel Preston (The Cult). As for Gene Loves Jez, I played all the guitars and bass on the material and also got them two drummer friends of mine, John Murphy and Steve Golding. I then formed Furyo with Abbo and this allowed me to experiment and expand my sound using Flood. I then started to record and compose/ produce my own guitar music for Virgin, David Puttnam films etc…then went solo and was signed by Equator who also look after Jeff Beck, Toni Iommi, Ozzy Osbourne etc.. They have looked after me ever since. I'm the stephen munson who wrote, the lyrics, co-wrote the music, designed the cover and played the keyboards .. with reference to the fascistic comment … songs of joy and faith .. was written for a ex-girlfriend Susan Jane Farthing, Troops for Tomorrow ( again my useless invention ) is from the sci-fi movie Galaxina .. and was reiterated again in one of the terminator movies many years later.. the prisoner was inspired by the tv series of the same name … as for production … Albie .. If Robbie and Mick didn't produce the record why is it printed … Produced by Robbie Grey and Mick Conroy … on the flip-side of the cover? nice to hear albies comments , i really like this single. also i've been looking for the de luca "revolution baby" single from around the same time ; is this in a similar vein?